To celebrate the release of RIPE FOR SCANDAL today, I'm returning to a post from last year about Newfoundlands. I feature one in SCANDAL, the stray, shipwrecked Gulliver. Like Pen in PLEASURE, he's a hero in his own right, but he's not quite as ready to be the family pet as she was. I based his personality on my godmother's wonderful Newfie, Ashley (she came with the name) who we often called Mrs. Pedecaris (as in "you are a great deal of trouble"), with a little of the beloved Newfie of my childhood, Hanuman, thrown in (he liked to "answer the door" by jumping up on it and opening his mouth over the small window so the new arrival was greeted by gullet and teeth), and with the "must save all swimmers" instincts of another Newf (my godmother's mother's dog) Gladstone. All the wonderful who-ha that has been generated for cats in the past week has me thinking about dogs getting short shrift. I’ve posted about Mastiffs previously, but today I’m going to talk about another giant breed that’s close to my heart, the Newfoundland. I grew up with Newfies. My family and a lot of friends had them, and they still hold a VERY special place in my heart. They are also among the breeds that my characters might have owned (hmmm, no dog has walked into my WIP so far . . . maybe we need a Newf to balance out the Mastiff in book one?). The oldest picture in England can be found on the Landseer website (portrait of Sir Humphrey Style by Robert Walker, 1625). 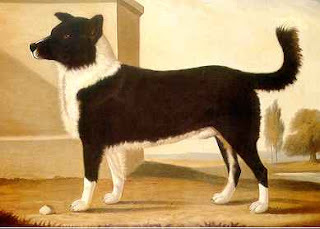 The breed was named by George Cartwright, who appropriately applied the name of the dog's native island to his dog in 1775. During the Georgian era, they tended to be lighter boned than those of today, though the one depicted with the Duchess of York in 1807 appears quite large and sturdy (top pic on the right, Princess Frederica Charlotte, Duchess of York, 1807, by Peter Edward). Like the one in that painting, all the images I’ve ever seen from the era show the black and white variety that came to be called “Landseer” in the late Victorian age (after the painter who popularized the breed; first image on the left, Lion by Edwin Landseer, 1824). You can find more images and more on the topic of coloration here. 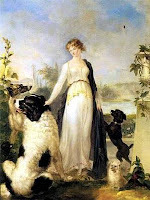 The AKC site gives their history thusly (on the right is Newfoundland dog by George Stubbs, 1803)." "There is much uncertainty about the origin of the Newfoundland. Some say that his ancestors are the white Great Pyrenees, dogs brought to the coast of Newfoundland by the Basque fishermen; others that he descended from a "French hound" (probably the Boarhound); but all agree that he originated in Newfoundland and that his ancestors were undoubtedly brought there by fishermen from the European continent. Many old prints of Newfoundlands show apparent evidence of a Husky ancestor, while other traits can be traced to other breeds. At any rate, a dog evolved which was particularly suited to the island of his origin." Whatever their ancestry, they were indispensible to fisherman as helpmeets (they pulled in then nets0 and were famous then as now for their natural instinct to rescue humans from the water (my godmother’s Newf, Gladstone, had to be locked in a room with no widows when we wanted to swim, or he’d “rescue” us from the pool). They were also used as carting dogs (as most large breeds were) and as sled dogs (as in Call of the Wild). In literature we have Pilot, Rochester’s dog in Jane Eyre, and of course Nana in Peter Pan (curse you Disney for misrepresenting her as a St. Bernard!). Nan was inspired by Barrie’s own Newfoundland, Porthos. So, any other breeds you’re dying to know about? Any particular dogs you’ve loved in books? What wonderful pictures of Newfies, Kalen! Thank you for the stories, too. :-) I didn't know Nana was a Newfie. Do you have anything to say about Papillons? I've heard a lot about them as lapdogs but I also understand they're every inch the spaniel. Lots of plot options in a dog like that, if true. I'll take a look around, Diane. I'll read about any dog, but I am especially partial to big dogs. Great post, Isobel! Love the pictures too. I've always loved the Baluchistan Hound in Frederica for big dogs in literature. But when I've written dogs I tend to write smaller ones, perhaps because that's what I have myself (Gemma's a lhaso/poodle mix). The Baluchistan Hound is certainly my favorite of Heyer's dogs, but her tiny Ulysses in Arabella is more of a character in his own right. I think I tend to write large dogs because I want them to DO something in the story, and what I need them to do usually involves fighting off the bad guys. Hope its not too late. Usually dogs in books are mutts. Mutts can be love but so can breeds. In "modern" mysteries Heyer had tow characters in two books (Death in the Stocks and Envious Casca.) who Breed bull terriers. I prefer smaller dogs, they get a bad rep but they be good if well-trained. I have a Bichon Frise. Ps I would like to know more about bull terrier. For Anonymous: I promise a post on bull and terriers soon. I had a Staffie for 16 years myself. Wonderful dog. When raised right, there's no dog in the world better than a pit bull. The ones in England at the time were not like the ones in Newfoundland that were being used for a variety of purposes. The working dog of Newfoundland was actually quite a bit smaller than the one in England. 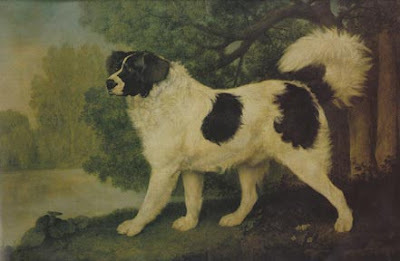 It was ancestor of the big Newfoundland and the Landseer and the retrievers. We don't know what Seaman looked like, but he could have been very similar to a black or black and white golden retriever.